According to the World Health Organization, swallowing just 120 milligrams of monocrotophos - the weight of about five grains of rice - can be fatal. 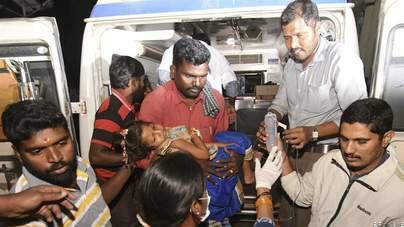 More than 100 others were hospitalised after devotees consumed portions of tomato rice blessed at the Hindu temple in the southern Indian state of Karnataka. The toxic pesticide that a UN agency asked India to ban a decade ago contaminated food that killed at least 15 people at a temple last week, police said on Tuesday. Laboratory tests showed the presence of monocrotophos - a pesticide that attacks the nervous system - in food and vomit samples. "We are trying to find out how the food got contaminated and not ruling out foul play. We have detained a few people and are inquiring further," said Chamrajnagar district police superintendent Dharmender Kumar Meena, without specifying the number of arrests. The same pesticide was responsible for the death of 23 schoolchildren in the eastern state of Bihar in 2013, one of India's worst mass poisonings. That was caused by cooking oil kept in a container previously used to store monocrotophos.